It is a rainy weekend here in Eugene. I’ve been to the garage a few times already this Sunday morning, checking on my bikes, touching them, I’d rather be riding! Instead, it’s another story I’m writing. This one was the ride I’ve taken on July 6th to visit my friends who live in the Portland area. Actually they live in Vancouver, WA. I’ve known them for some 20 years already. Visiting them is like going home. I usually go to Portland by car, the most efficient route to get there is via I-5. 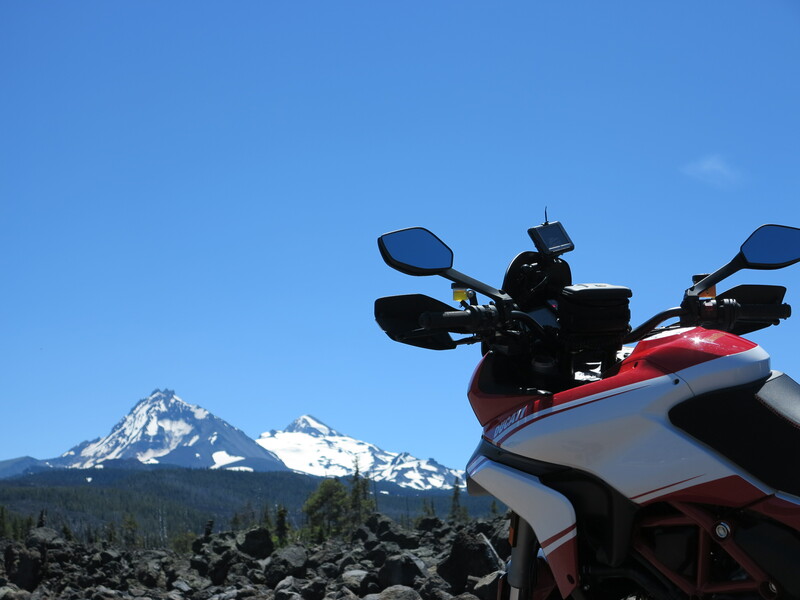 But the Multistrada has shown it handles long riding days very well. Meaning it is comfortable, and it is fun to ride it for hours on end. 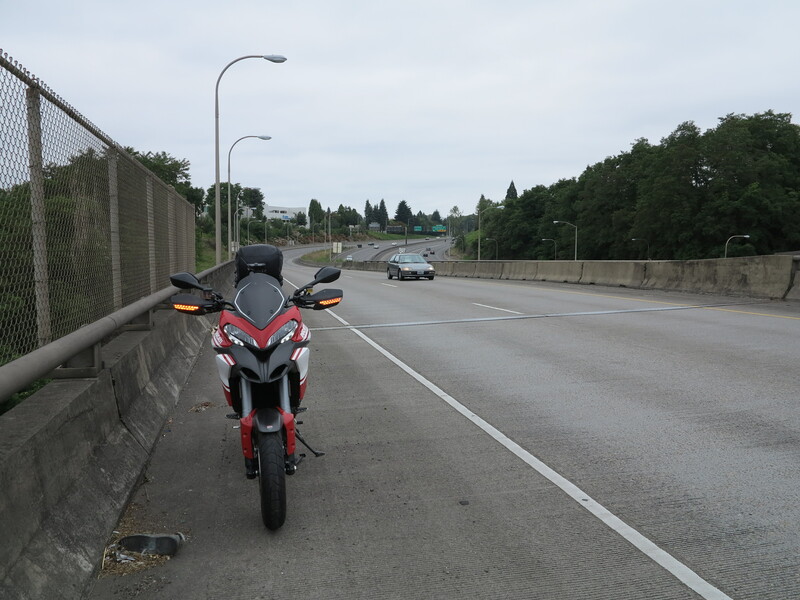 Therefore if I program a long way ’round to get to Vancouver, avoiding I-5 except for a few miles, the Ducati becomes my best mode of transportation. This time the choice for going north was the high desert. First, I took Hwy 242. It would be my third time this year, and not the last, going through the McEnzie pass. Nothing like a sunny and blue sky day! 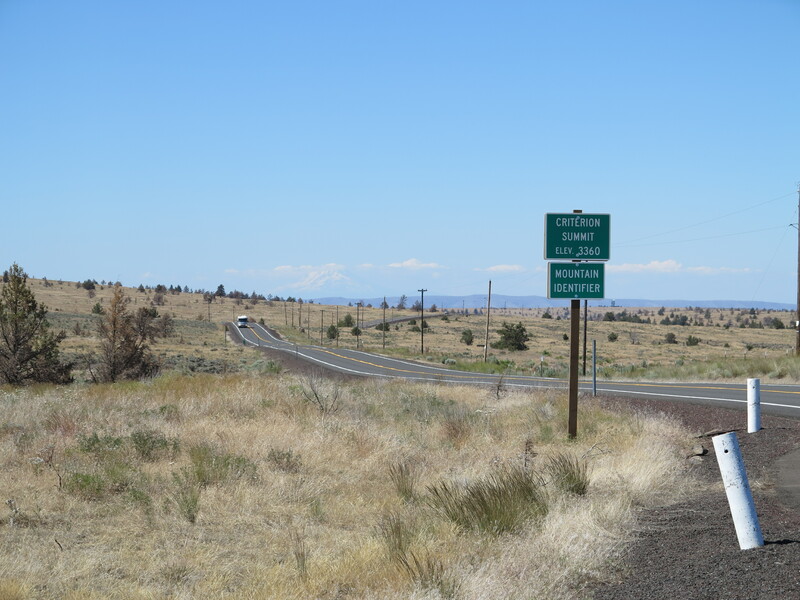 From there I took 97 north towards Madras and then 197 towards The Dalles. Made a stop at the Criterion Summit. 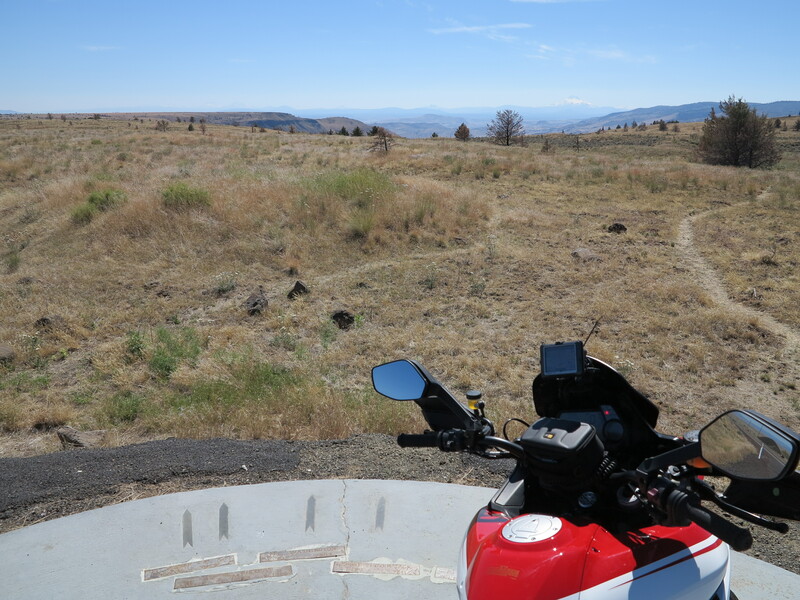 Where at the road’s summit there is a view point with a circle made out of concrete with the names of the Cascade peaks and arrows pointing at their direction. 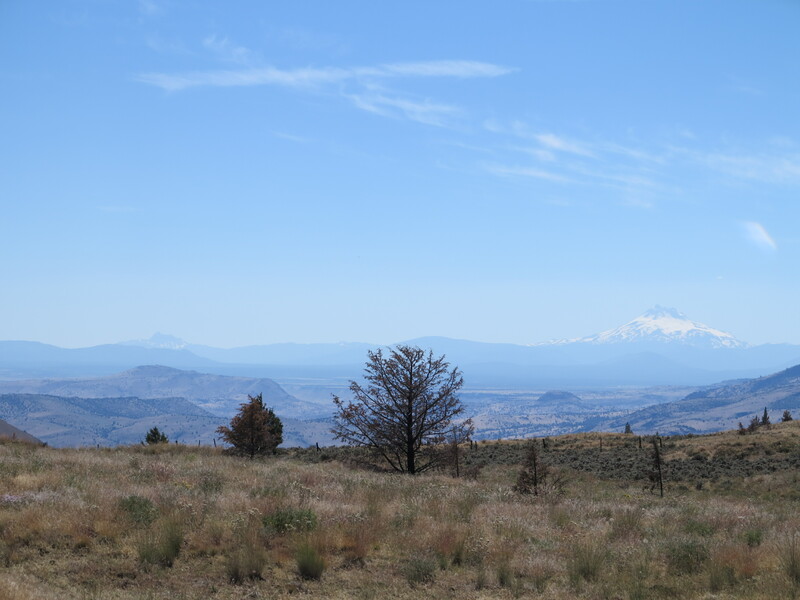 Three Fingered Jack and Mt Jefferson are visible in the distance. 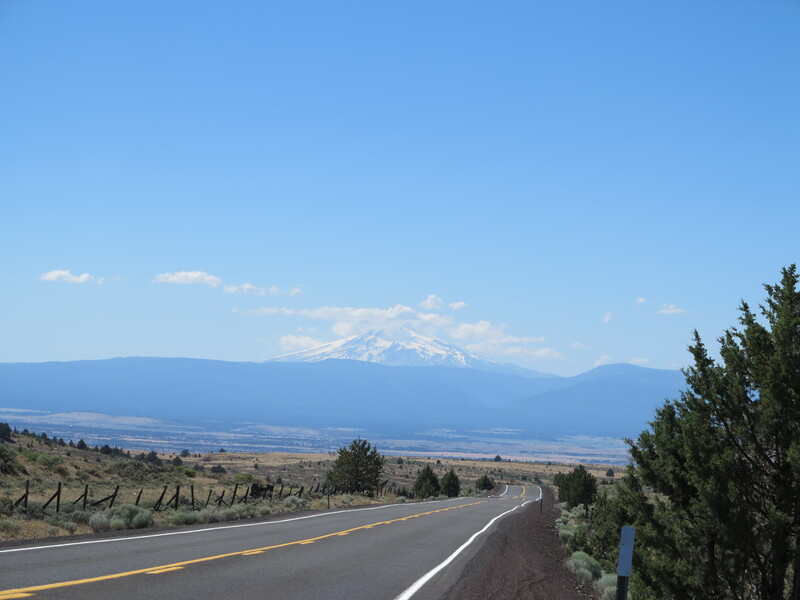 Going towards Maupin on 197 I made another stop for a photo of Mt Hood. 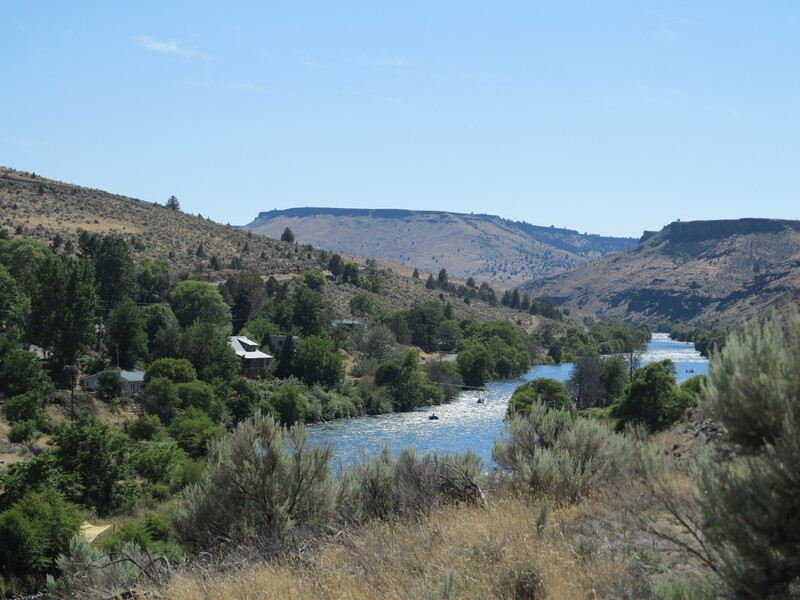 I had been to Maupin in the past for white water rafting in the Deschutes River. Not as challenging as the New River in West Virginia where I went rafting so many years ago, my only other rafting experience. 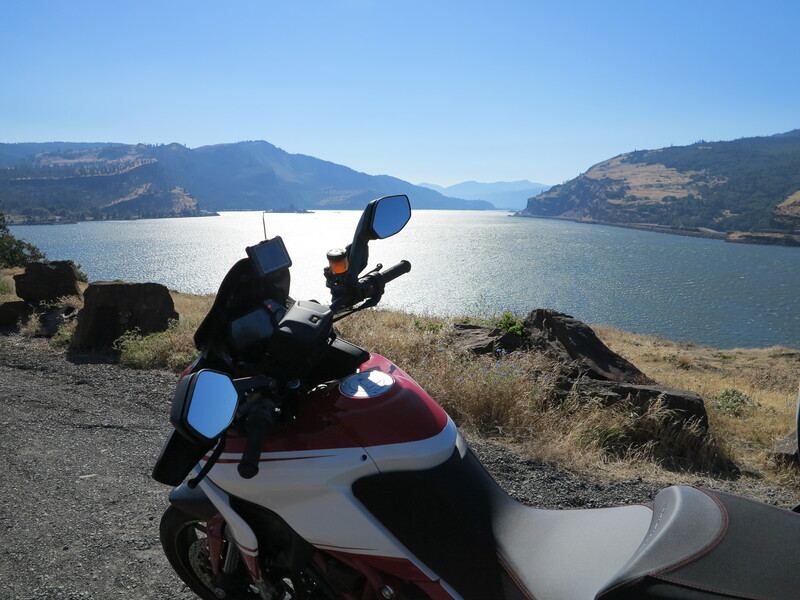 Continuing north I stopped in The Dalles and fueled the bike with non-ethanol gasoline. 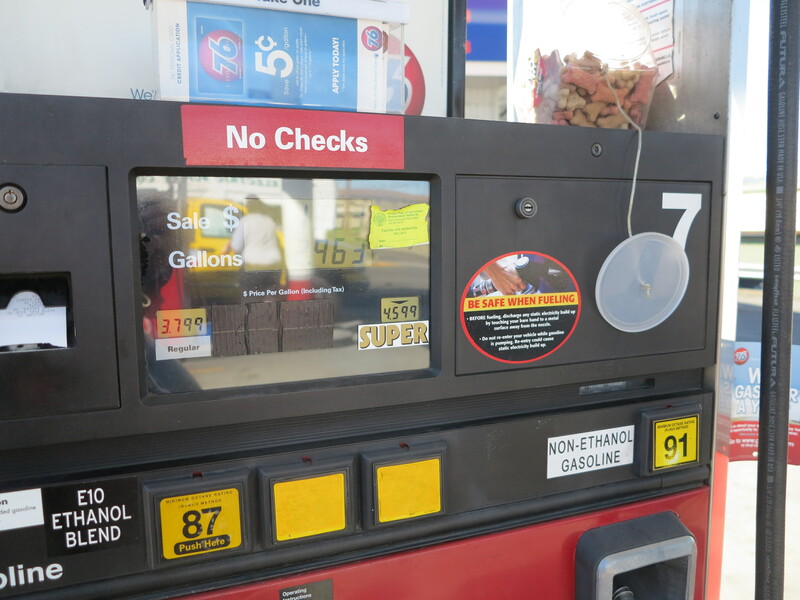 As I was completing my transaction another rider was already waiting for the non-ethanol pump. I’m not the only one who gets out of the way and pay the higher price for the privilege of filling up a motorcycle tank with non-ethanol gasoline. 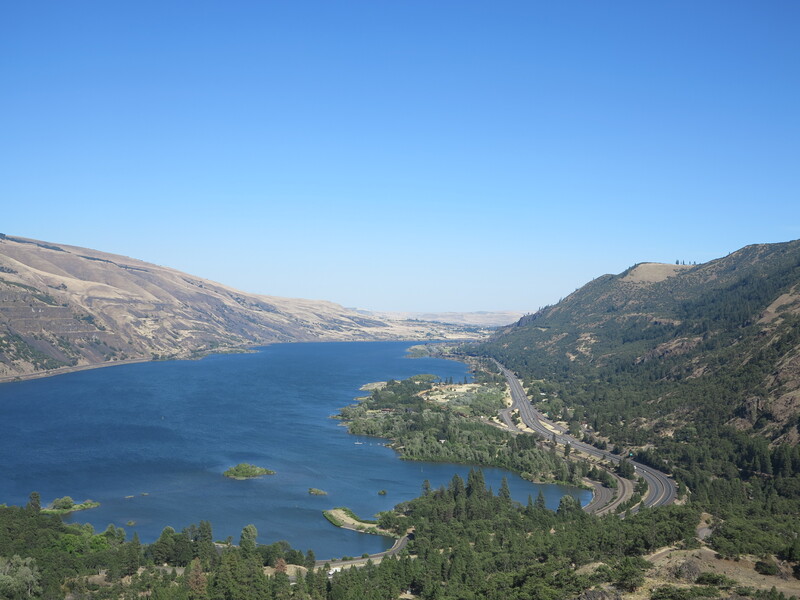 From there I took the old historical Highway 30 to better enjoy the views of the Columbia gorge. 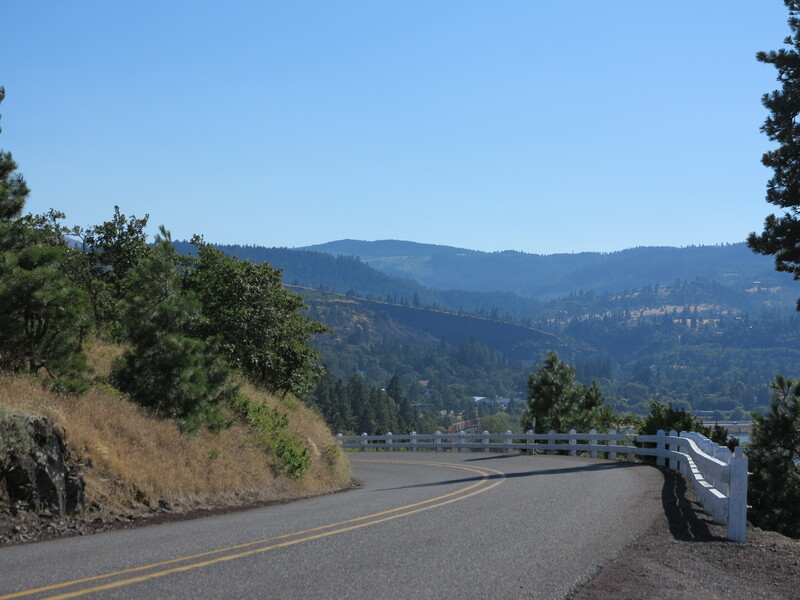 I continued some more on Highway 30, which is a very nice motorcycle road. But it can be very windy at times, or most of the time. Especially after 3pm, when the westerly winds start blowing more intensively. 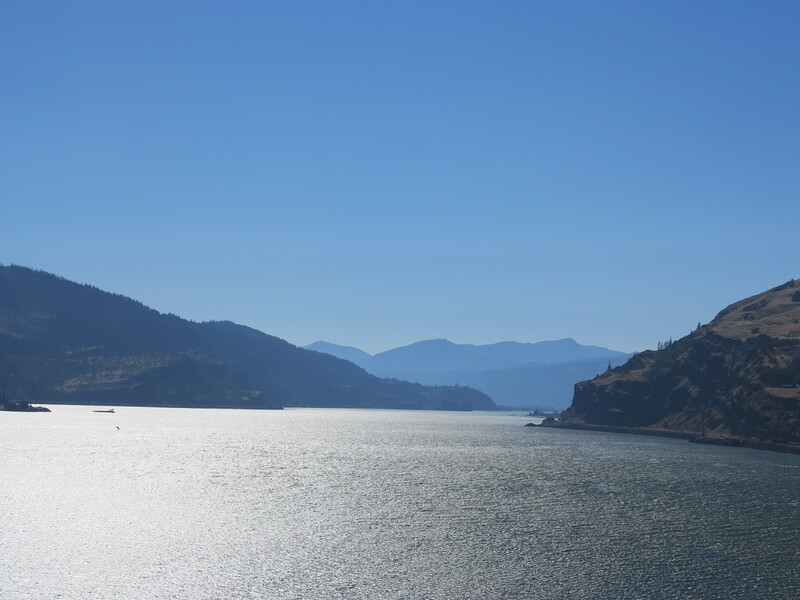 I remember these winds from the time I used to sail at the Columbia River. Hwy. 30 offers great views of the river and its gorge. But the sun was going down and I had to be in Vancouver for dinner. I made it to Sierk’s house just in time for dinner. I parked the bike and had this nice view of the bike, Sierk’s carefully designed back yard, and his new detached garage. It’s like the bike belonged to this place, it deserved a photo. It was great being there, having a meal with Sierk and his family and also my friend Chris and his family who also live in Vancouver and were there as well. I captured on photo a rare moment when the three of us are having a conversation, drinking beer, and were not surrounded by the kids. They have lovely kids, but they are too young, at an age where they don’t yet participate on conversations. Several more years and this picture will probably change. The next day I say my goodbyes early in the morning and start my way back to Eugene. I did not have a route programmed yet. I was thinking of crossing the Columbia on the I-5 bridge and from there find my way west towards the coast. 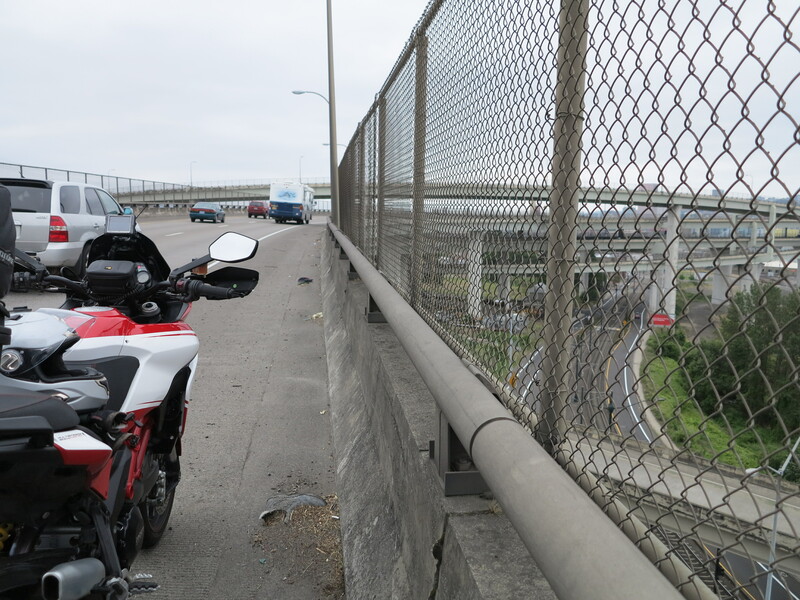 But as soon as I’m about to get on the I-405 bridge I feel the rear of the bike gets loose, the dreadful feeling of a flat tire… I stop and it is confirmed. Well, I have the kit to fix it. But I quickly learned it was not a nail perforation. It was a cut. I could not fix that. A small cut, the Pirelli tire said good bye. This tire had about 3,600 miles on it. It was probably good for another thousand miles or more. But thinking about this was beyond the point. My real worries were related to where I came to a stop. I was at the entrance ramp of I-405 as it climbs towards the bridge that crosses the Wilamette and cars were zooming by. 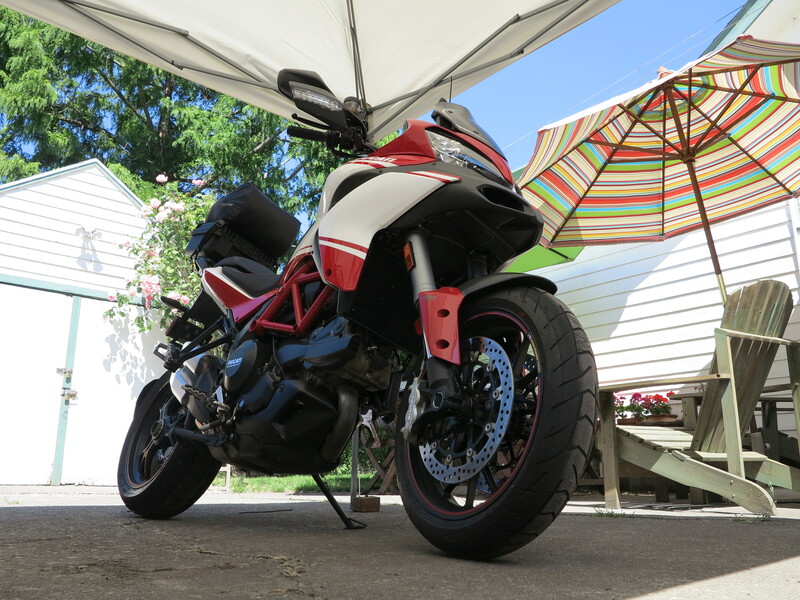 I called Ducati Roadside Assistance. 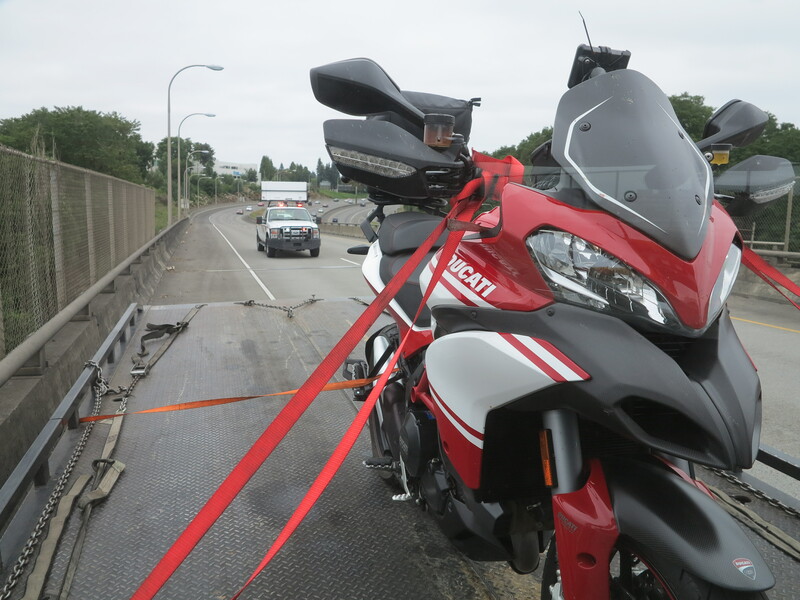 Because it was Sunday and the local Ducati shop was closed, and Tuesday I was going on a long trip to the Marshall Islands, I had no option by tow my bike back to Eugene. 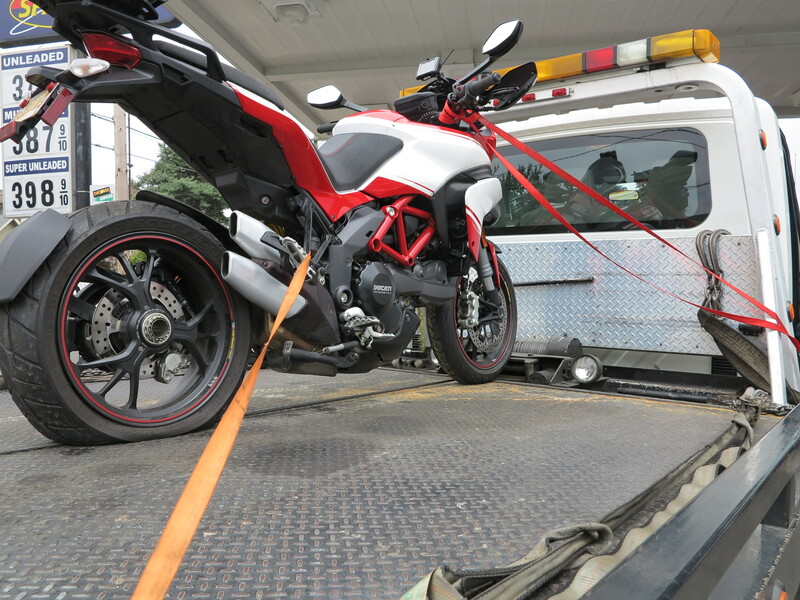 At a $4 for mile it was going to cost me about $440 to tow it to Eugene and the Ducati Roadside Assistance service would only cover some $200 of it. So I instead called AAA. It would cost me only $40 because I have the Plus membership covering 100 miles of towing. The driver arrived and soon started to work on getting the bike on the flat bed. The guy was not interested in what I had to tell him about this bike, the semi-active suspension, and how careful he needed to be to load it. But as I started to document with photographs his every move, he changed his demeanor and started to listen to me and ask me for approval and assistance on every move. 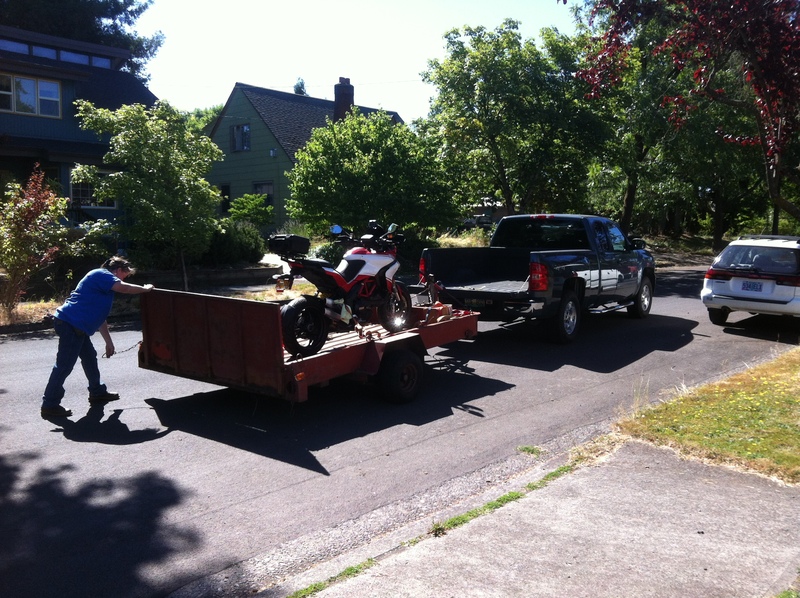 By the time the bike was loaded on the tow truck, a city truck with the lane closed sign showed up. According to the tow truck driver, the city probably saw his tow truck lights on one of the many traffic cameras. I would hope they would had come because they had seen I was stranded on the bridge. on a precarious location. The truck driver stopped to re-fuel the truck and we got on our way, a long, 110 miles trip to Eugene. The bike and I made it safely to Eugene. I parked the bike in the garage and a couple of days later I was on a 10-day work related trip to the south Pacific. In the end, it was a much better experience than what happened with the AAA guy. She was willing to work with me, to listen to my suggestions. She assumed I would know more than she would in terms of handling my motorcycle. Everything went fine. And the bike got a new Pirelli Scorpion Trail rear tire. 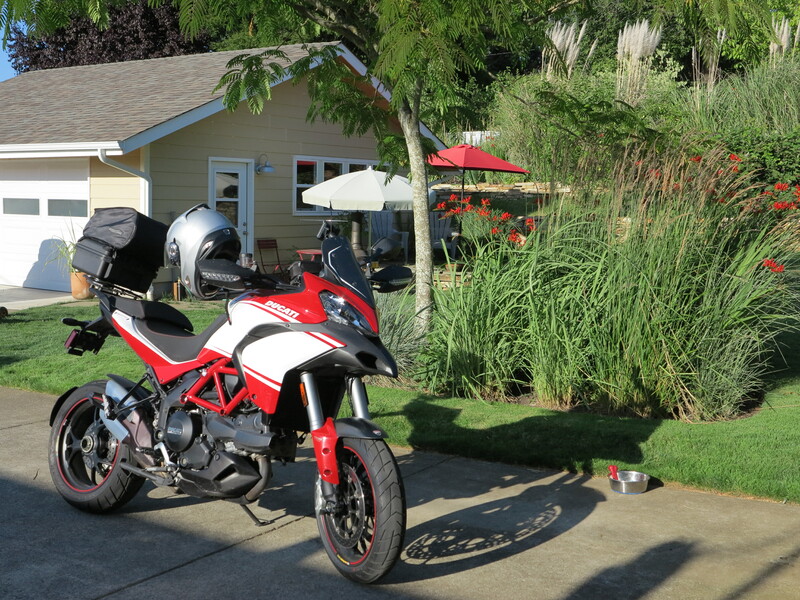 This entry was posted in Riding the Ducati and tagged 2013 Multistrada, Ducati. Bookmark the permalink. Oh, how I feel your pain. 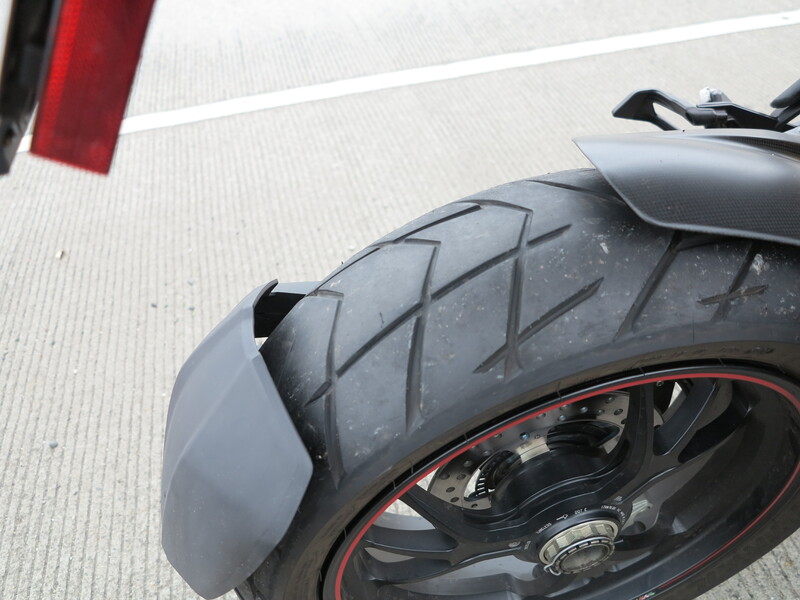 My Duc just got a rear flat last week. Saturday turned out to be a much better day than the weather guessers forecast, so I rode over to Magnusson Park by Lake Washington here in Seattle. After a day lollygagging by the water, watching boats and seaplanes, I got back on the bike…and immediately felt the flat-tire wobble. Huge piece of metal (nail? something else? hard to say…) jutting out. I had removed the top case and left it at home just for something different. Except it carries my Cycle Pump (Best Rest). Nothing to do but call AMA’s roadside assistance. I’d just renewed my membership, and the rep couldn’t find me in the system, so she ended up charging me $125 for the tow. Happily, after sending an e-mail to AMA, I got a call back with apologies, the rep should have seen me in the system and of course they’d back out the charge for the tow. The “insult to injury” to this story, however, is that I had *just* replaced my Scorpion Trails, front and rear, each with around 6,500 miles on them. The new Angel GTs were just broken in at 148 miles. And now I have a new, new rear tire. Such is the way of the things, right? And meanwhile, I’m wistfully looking at the bike under its cover (no garage…yet; I moved to Seattle from NYC back in November and am staying with a friend at his townhouse; good deal, just no garage) while the rain and wind beat down. Ah, well, I guess I’ll just read more of your stories! P.S. You might enjoy a few shots from the SoundRider Rally in the Gorge. If you haven’t heard of this rally, you might consider it as a destination for next year. Info at http://www.soundrider.com/rally/. 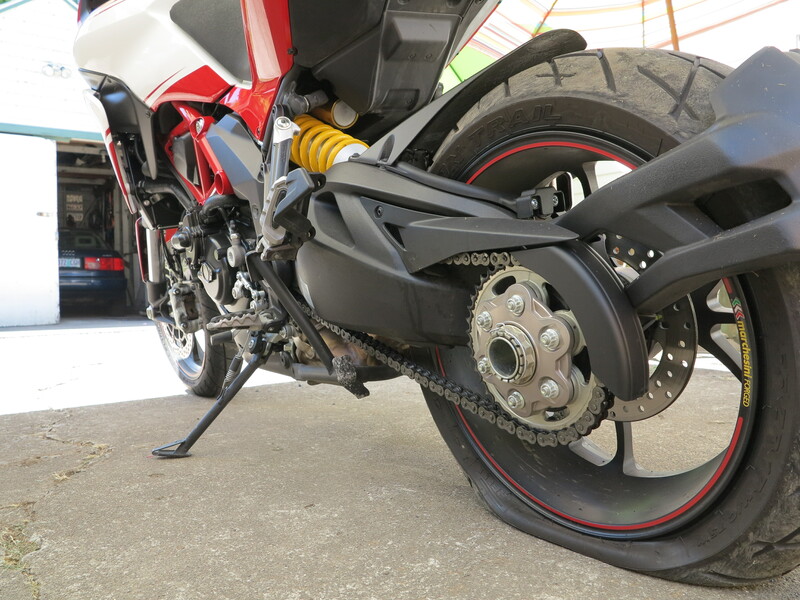 When I was leaving the Ducati shop with my new rear tire I had this thought… what if I get another flat tire again? Yes it can become an expensive experience. And I was going to get the Angel GT but they were not available at that time. Next time perhaps, as I hear the last longer than Scorpion Trails. Welcome to the west coast! And the rainy season. I will check the link of the SoundRider Rally in the Gorge. Thanks for writing a note! I was on pins and needles wondering how you were going to get your bike home. Glad it all worked out and now you have a new tire. Doesn’t seem like much mileage before your tire is worn out. 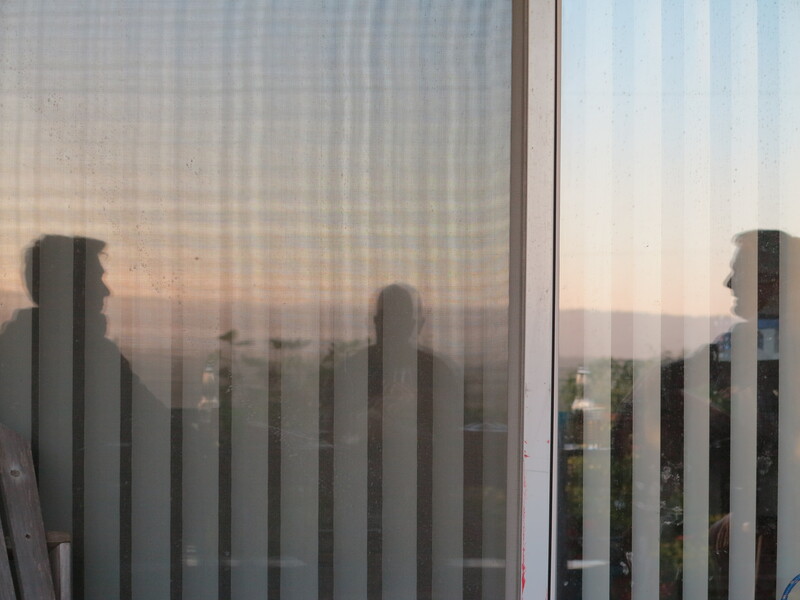 I am behind too as I could not get internet every day so I have lots to write about my trip across the country and I am only now working on my video. I went to the Soundrider rally in Stevenson, WA around 2008 (or was that 2007?) can’t remember. I met lots of people there and the group rides take you to scenic places you don’t know about. I wonder how your tire got cut ? I can imagine how much you have to write about your trip cross country. I don’t know what cut the tire, I don’t remember running across anything. I haven’t checked the Soundrider Rally yet. Sounds like something to put in my calendar for next year.